"Massachusetts, Births, 1841-1915," index and images, FamilySearch (https://familysearch.org/pal:/MM9.1.1/FXJL-FWV : accessed 28 Oct 2012), Harry Oscar Merrill in entry for Thurl Palmer Merrill, 1910. 1920 United States. Bureau of the Census. 14th census, 1920 population census schedules, Washington, District of Columbia: The National Archives, ([193-?]) , Census Place: Waltham Ward 1, Middlesex, Massachusetts; Roll: T625_719; Page: 2B; Enumeration District: 483; Image: 634. "Massachusetts, Deaths, 1841-1915," index and images, FamilySearch (https://familysearch.org/pal:/MM9.1.1/NW1J-R9B : accessed 06 Nov 2012), Wesley J Merrill, 1906. "Massachusetts, Births, 1841-1915," index and images, FamilySearch (https://familysearch.org/pal:/MM9.1.1/FXFK-BRY : accessed 06 Nov 2012), Wesley J. Merrill, 1904. Delayed Certificate of Birth, State of New Hampshire, , State File No. 3894. "Massachusetts, Marriages, 1841-1915," index and images, FamilySearch (https://familysearch.org/pal:/MM9.1.1/N47F-DX4 : accessed 06 Nov 2012), Wesley Scott Merrill and Bertha Florence Reynolds, 1903. "United States Census, 1910," database with images, FamilySearch (https://familysearch.org/ark:/61903/1:1:M2J8-7V2 : accessed 8 December 2016), George Reynolds, Lawrence Ward 6, Essex, Massachusetts, United States; citing enumeration district (ED) ED 360, sheet 25B, family 541, NARA microfilm publication T624 (Washington D.C.: National Archives and Records Administration, 1982), roll 583; FHL microfilm 1,374,596. "Massachusetts, Deaths, 1841-1915," index and images, FamilySearch (https://familysearch.org/pal:/MM9.1.1/N49F-CQ7 : accessed 06 Nov 2012), Lillian B Merrill, 1909. Eben Putnam, Lieutenant Joshua Hewes; a New England pioneer, and some of his descendants, with materials for a genealogical history of other families of the name, and a sketch of Joseph Hewes, the signer, Vol. 1, , at https://books.google.com/books?id=8W4-AQAAMAAJ . New York: J.F. Tapley co., (1913) , p. 345. "New Hampshire Death Records, 1654-1947," database with images, FamilySearch (https://familysearch.org/ark:/61903/1:1:FSKV-99P : 12 December 2014), Eliza A Colley, 15 Sep 1888; citing New London, Bureau Vital Records and Health Statistics, Concord; FHL microfilm 1,001,068. "Massachusetts Deaths, 1841-1915," database with images, FamilySearch (https://familysearch.org/ark:/61903/1:1:NW9Q-2ZZ : 10 December 2014), Geo. A. Hinckley, 25 Jun 1885; citing Newton, Massachusetts, v 365 p 173, State Archives, Boston; FHL microfilm 960,229. "Massachusetts, Town Clerk, Vital and Town Records, 1626-2001," database with images, FamilySearch (https://familysearch.org/ark:/61903/1:1:FHRZ-X4N : 13 July 2016), Robert Hinckley and Esther Messinger, 29 May 1806; citing Marriage, Boston, Suffolk, Massachusetts, United States, , town clerk offices, Massachusetts; FHL microfilm 818,094. The William and Alice Hinckley Fund, First Unitarian Church, San Francisco, , at https://books.google.com/books?id=TkA1AQAAMAAJ . San Francisco: (1890) , pp. 13-6. "Massachusetts Deaths and Burials, 1795-1910," database, FamilySearch (https://familysearch.org/ark:/61903/1:1:FH8V-6FD : 10 December 2014), George A. Hinckley, 25 Jun 1885; citing , reference 145; FHL microfilm 842,870. "New Hampshire Marriage Records, 1637-1947," database with images, FamilySearch (https://familysearch.org/ark:/61903/1:1:FL8F-3JF : 12 December 2014), John William Kiniry and Barbara Ruth Messing, 03 Nov 1945; citing Westville, , New Hampshire, Bureau of Vital Records and Health Statistics, Concord; FHL microfilm 2,293,148. "Massachusetts Births, 1841-1915", database with images, FamilySearch (https://familysearch.org/ark:/61903/1:1:FXKV-16C : 1 March 2016), Barbara Messing, 1915. "United States Census, 1930", database with images, FamilySearch (https://familysearch.org/ark:/61903/1:1:X7N4-DHC : 8 December 2015), William C Messing, 1930. "Massachusetts, Marriages, 1841-1915," index and images, FamilySearch (https://familysearch.org/pal:/MM9.1.1/N4XF-4QQ : accessed 02 Dec 2012), William C Messing and Eleanor Sivret, 1915. (?) Miller was born perhaps about 1993. Charles Miller was born perhaps about 1899. Rich Miller, "Ancestors and their Descendants - Person Page 862," e-mail message from e-mail address to Steven G. Levine, 1/17/2009 10:47 PM. Drum Foundation, a philanthropic concern in San Francisco. 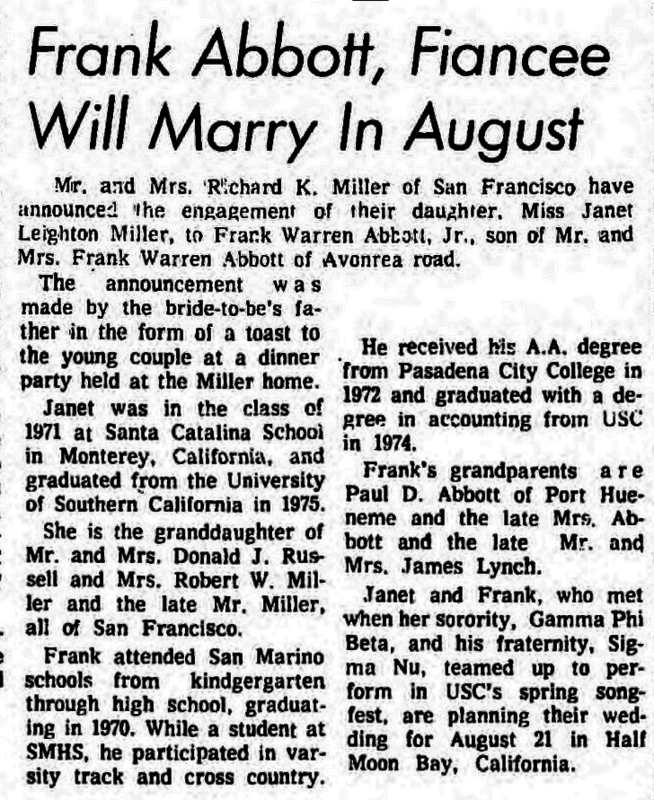 Studied at University of Southern California. 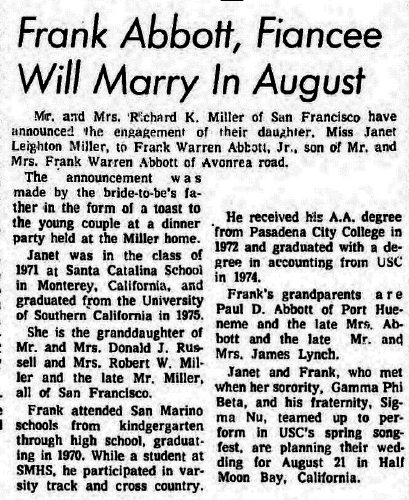 Frank Abbott, Fiancee Will Marry In August, San Marino Tribune, San Marino, Calif., June 17, 1976, page 3. 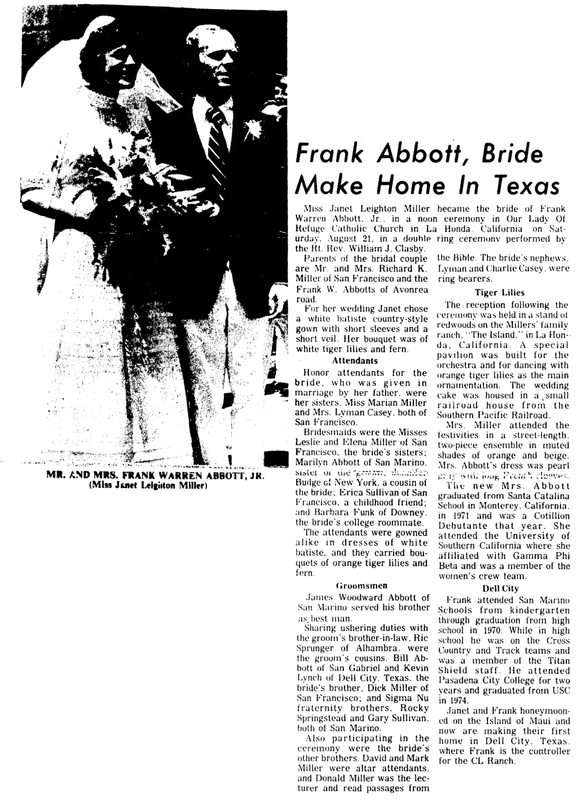 Frank Abbott, Bride, Make Home In Texas, San Marino Tribune, San Marino, Calif., Sept. 30, 1976, p. 3. William Richard Cutter, Genealogical and personal memoirs relating to the families of Boston and eastern Massachusetts, Vol. 1, , at https://books.google.com/books?id=OU0k2d8nl3IC . New York: Lewis historical Pub. Co., (1908) , pp. 793-4. William Richard Cutter, Genealogical and personal memoirs relating to the families of the state of Massachusetts, Vol. 4, , at https://books.google.com/books?id=FM8UAAAAYAAJ . New York: Lewis historical publishing company, (1910) , p. 2579.